Delicious one pot meal, smothered chicken with mushroom gravy. 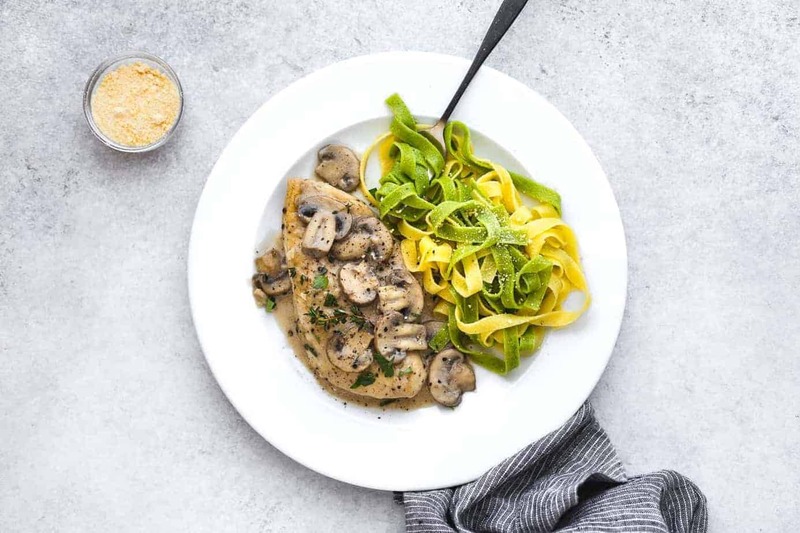 Perfectly tender chicken breasts smothered in a savory gravy that’s sure to become a family favorite. No mushroom soup needed! Looking for quick chicken dinner recipes? 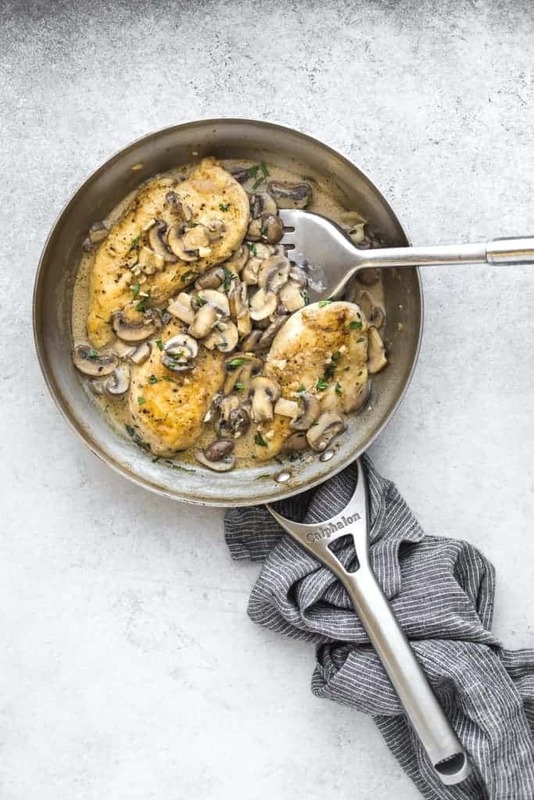 You can’t go wrong with a one pot meal like this chicken with mushroom gravy recipe. This delicious chicken dish is so easy to make, yet is so flavorful and can be ready in less than 30 minutes. Try this dish with steamed veggies, rice pilaf, mashed potatoes or pasta. 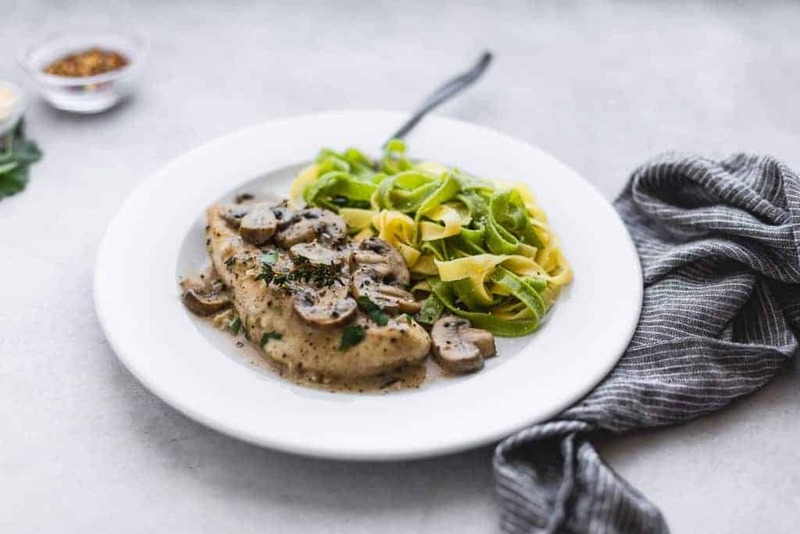 In order to get moist and tender chicken with the mushroom gravy, be sure to cut the chicken breast in half and pound it to an even thickness (about 1/4 inch in thickness) by using the bottom of pan or a meat mallet. 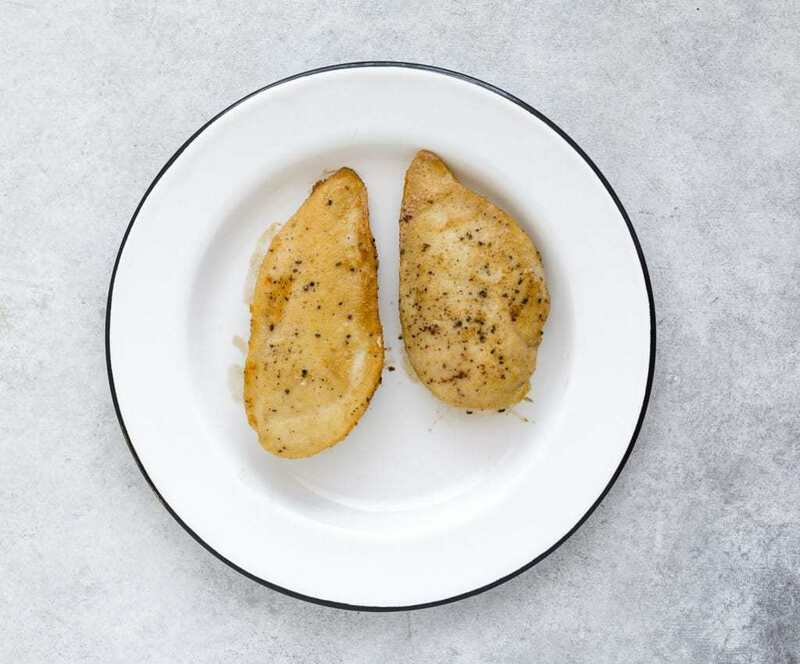 You can also opt to use chicken breast thin fillets which are already at a nice thickness and can be found at any grocery market. I dredged the chicken in seasoned flour then cooked them until they had a nice golden color and a very subtle crust. Once the meat was done, I used the same cooking pan to cook mushrooms, garlic and the other remaining ingredients. I didn’t wash the pan after cooking the chicken as the flavorful browned bits give extra flavor for the mushrooms. There are thousands of ingredients to choose from when seasoning chicken and other meats. While I like to venture through many of them I often come back to timeless basics like garlic cloves or fresh thyme, My kids are big fans of chicken and I’m always a happy mom when they’ve cleared their plates of all of the chicken and veggies that I gave them. I haven’t reached the point where it’s their favorite meal (that one may always be pizza), but I’m glad that they’re eating healthy meals and oftentimes asking for extra servings. Hope you’ll enjoy this chicken with mushroom gravy recipe. In a medium mixing bowl, add 1/2 teaspoon thyme, onion powder and flour. 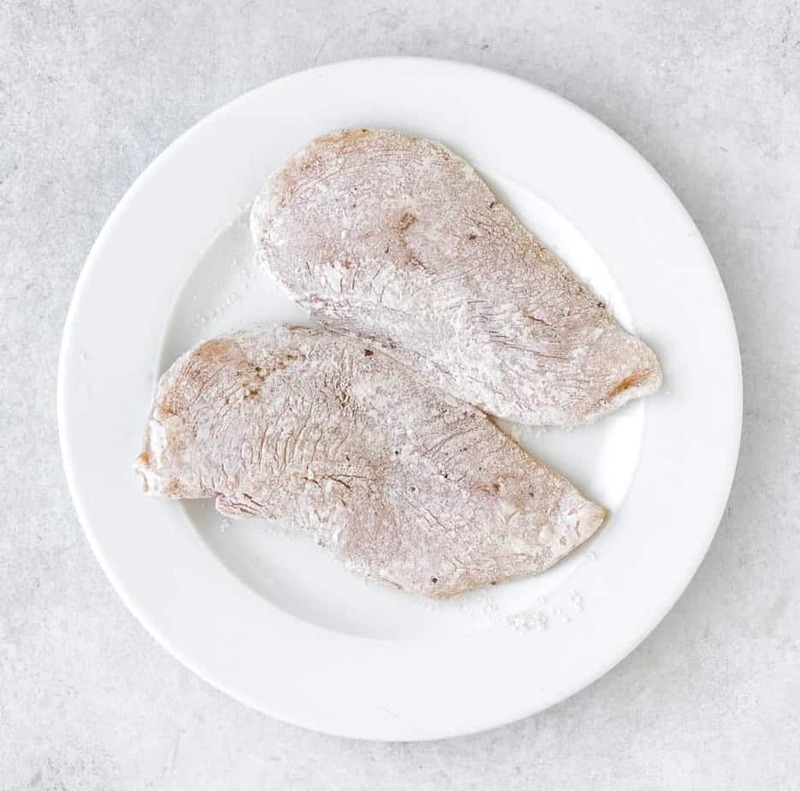 Cut the whole chicken breast in half and pound it to an even thickness with the bottom of pan or a meat mallet. If you use the pre-cut chicken breast thin fillets, skip this part. Season the chicken with 1/4 teaspoon salt. Dredge it to the seasoned flour and shake off the excess flour. Melt butter in a skillet pan over medium-high heat. Add chicken, then sear it for about 1-2 minutes per side or until golden. Remove to a plate. Using the same skillet (do not wash), add mushrooms and 1 teaspoon fresh thyme (or use more according to your liking). Cook until mushrooms are brown (for about 4-5 minutes). Add garlic and cook until fragrant, for about 30 seconds. Stir in dry white wine, chicken stock and heavy cream. Bring to a boil, stirring occasionally for about 2-3 minutes. Season with salt and peppercorn (or black pepper) to taste. Return the chicken back to the pan. Keep it uncovered and reduce the heat to a medium-low. Simmer until the chicken is fully cooked and the sauce has thickened for about 5 minutes. Remove the chicken and mushrooms from the heat. Serve immediately with steamed veggies, pasta or rice. I am always a big fan of a one pot meal like this. The sauce sounds great and I am sure this is a new way that chicken will be cooked for a family dinner during the week. I have done nothing in the fridge that I need to cook soon. Turning them into a hearty gravy sounds perfect. This recipe sounds out of this world, Rika. As usual, your photos are amazing too. They make me want to jump right through the monitor and devour the chicken dish! That looks very delicious. I’m always looking for other ways to cook chicken. My family loves dishes like this one. It makes them feel cozy and warm! I can’t wait to try it. Can we just talk about the perfection of these photos? They’re totally making my mouth water – on top of how good the recipe looks! Oh wow this is literately my perfect dish!! I LOVE chicken with mushroom sauce, whatever the recipe! You cant beat it, I am so going to try this next week for my family! Yum! I love everything and anything with mushrooms, and this looks delicious. The chicken looks appetizing.